on Sunday, March 3, at 10:15 a.m.
Join us for an exceptional opportunity for a window into the current state of Israeli-Palestinian relations. "We are the children of God. All of us. No exceptions. No orphans. Every human being is a child of God. Every one of us. God called you into life when you took your first breath. God has watched over your life every year that you have lived. And God will hold your life in safe keeping even after you lay it down and walk from this world to the next. There is no space outside the circle of God's care. We are all the beloved of the household of God. No exceptions. No orphans. We are the children of God. We are what love becomes when love is given life." We are delighted to welcome noted theologian and gifted teacher Marcus Borg as the keynote speaker for All Saints’ LENT EVENT 2013. 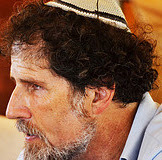 Internationally known in both academic and church circles as a leading biblical and Jesus scholar, Dr. Borg has been in the forefront of the movement calling the church to reclaim the Christianity of Jesus by putting its faith in action in the world. Sunday, March 17: Marcus Borg in the Rector’s Forum at 10:15 a.m.
“The Passion of Jesus: The Way and the Kingdom,” 6:00 p.m.
“The Passion of Jesus: Holy Week, Good Friday, and Easter,” 7:00 p.m.
Jesus, full of the Holy Spirit, returned from the Jordan and was led by the Spirit in the wilderness, where for forty days he was tempted by the devil. Jesus ate nothing at all during those days, and when they were over, he was famished. The devil said to him, “If you are the Chosen One, command this stone to become a loaf of bread.” Jesus answered, “It is written, ‘One does not live by bread alone.’” Then the devil led Jesus up and showed him in an instant all the kingdoms of the world. And the devil said to him, “To you I will give their glory and all this authority; for it has been given over to me, and I give it to anyone I please. If you, then, will worship me, it will all be yours.” Jesus answered, “It is written, ‘Worship the Lord your God, and serve only God.’” Then the devil took Jesus to Jerusalem, and placed him on the pinnacle of the temple, saying, “If you are the Chosen One, throw yourself down from here, for it is written, ‘God will command angels concerning you, to protect you,’ and ‘On their hands they will bear you up, so that you will not dash your foot against a stone.’” Jesus answered, “It is said, ‘Do not put the Lord your God to the test.’” Having finished every test, the devil departed from him until an opportune time. On a personal level, I suppose this is the temptation to power; perhaps even to wealth; to standing out, if you will. But it's also the imperial temptation--the temptation to rule the world. This is the temptation that we as a nation face in our time, for we are the imperial power of our time. Ever since the end of the Cold War, we are the world's only superpower, and that power is made up of two elements: military power and economic power. Those are the two classical marks of empire. Empire is not simply about geographical expansion. Empire is possessing military and economic power to such a degree that you can shape the world in your own interest. We, the United States, are the imperial power of our time, and how we use that matters greatly. It's very important to realize that in the First Century, the phrase “Kingdom of God” was a political metaphor, and it was also a religious metaphor. Jesus could have talked about the community of God or the family of God, but he talks about the Kingdom of God. The imperial temptation is the temptation that we now face as a country. It is a test of loyalty that faces us as Christians. I don't mean that Christians can come out on only one side of an issue. But I do mean that Christian reflection needs to take seriously the Biblical suspicion of empire and Christian teaching about war and peace. We need to be as thoughtful, responsible, and creative as possible in the use of our imperial power … for imperial power can be used in two very different ways. We can use it to control the world in our own self-interest – to structure the system so that it serves us to impose our will on the world. Or imperial power can be used to build up. We can use it with the world's well-being in mind, rather than with primarily our own well-being in mind. 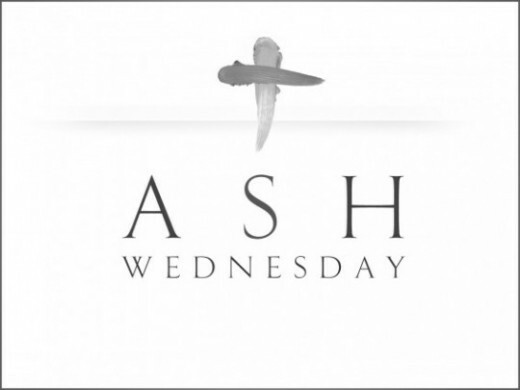 Lent is a season in which we are reminded of the temptations that face us, not just in this hour, but more comprehensively across our lives – a season of repentance in which we need to be discerning about the temptations of our lives. In this season, we are called to repent, which means to return to God – to reconnect with the one from whom we came and in whom we live and move and have our being. It means to go beyond the mind that we have as we learn once again and learn more deeply: that we do not live by bread alone, that we should not put God to the test, that we are to worship and serve God alone, that God alone is our Lord. Amen. 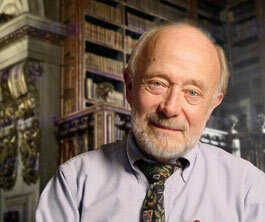 * We are delighted to welcome noted theologian and gifted teacher Marcus Borg as the keynote speaker for All Saints’ LENT EVENT 2013. 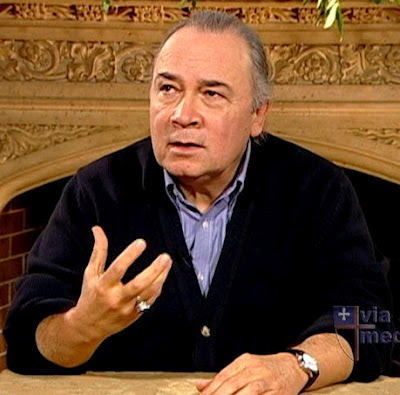 Internationally known in both academic and church circles as a leading biblical and Jesus scholar, Dr. Borg has been in the forefront of the movement calling the church to reclaim the Christianity of Jesus by putting its faith in action in the world. For more information or to register for the Lent Event click here. 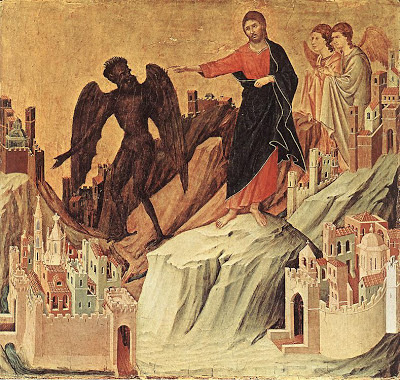 Jesus, full of the Holy Spirit, returned from the Jordan and was led by the Spirit in the wilderness, where for forty days he was tempted by the devil. He ate nothing at all during those days, and when they were over, he was famished. The devil said to him, "If you are the Son of God, command this stone to become a loaf of bread." Jesus answered him, "It is written, 'One does not live by bread alone.'" Then the devil led him up and showed him in an instant all the kingdoms of the world. And the devil said to him, "To you I will give their glory and all this authority; for it has been given over to me, and I give it to anyone I please. If you, then, will worship me, it will all be yours." Jesus answered him, "It is written, 'Worship the Lord your God, and serve only him.'" 'He will command his angels concerning you, to protect you,' and 'On their hands they will bear you up, so that you will not dash your foot against a stone.'" Jesus answered him, "It is said, 'Do not put the Lord your God to the test.'" When the devil had finished every test, he departed from him until a more opportune time. I can’t even begin to estimate how many times I’ve heard and/or preached this Gospel According to Luke appointed for the First Sunday in Lent … and yet this year I had one of those “heard it again for the first time” experiences with it. And what I heard – for the first time – is that the third temptation … the one that sends the devil off to wait for “a more opportune time” … is arguably the Temptation of Scriptural Literalism. Seriously. Check out the passage above. In the first two challenges, Jesus responds with quotes from Scripture: “One does not live by bread alone” and “Worship the Lord your God, and serve only him” – and the devil is stumped. It is in the third one that the pattern changes. And there it is. After decades of reading, marking, learning and inwardly digesting this Gospel According to Luke, on this First Sunday in Lent 2013 I was struck with the divine irony that when the devil had run out of other temptations, he turned to Scriptural Literalism in his last ditch effort to keep Jesus from his appointed rounds as the rabble rousing rabbi from Nazareth. I am confronted with how that pattern has continued in the church over the last two thousand years as it has succumbed over and over again to the temptation to confuse the Living Word of God with the Literal Words of God and has let the devil tempt it into using the Scriptures as weapons to defend the Institutional Church rather than as tools to build the Kingdom of God. May God give us the grace – and the wisdom and courage – to go and do likewise. Because God knows we've got work to do! To sleep when I would watch. But not ignore its touch. It’s thus I’ll keep my Lent. the entry point for yet another 40-day Lenten journey toward Easter. we are called to make a shift, too. one of the “Ahas!” of God. and ultimately, to the resurrection. Don't give up epiphanies for Lent. in the next 40 days. and reminds us that we are also called to "do justice." as Lenten pilgrims and always. "Why do we fast, but you do not see? Why humble ourselves, but you do not notice?" to accompany us wherever the journey goes. in our streets and in our nation. to the changes, chances and challenges of the global economy. who prioritize drone warfare over child welfare. of the equal protection guaranteed all Americans. as we work for just immigration reform. Now IS the acceptable time.